Mixed green salad with blue cheese, fresh pears and candied walnuts, tossed in a light balsamic vinaigrette. 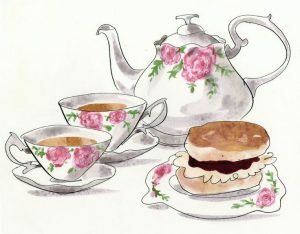 An assortment of traditional English teatime sandwiches. Served on wheat and white bread. We remove the crusts, cut into triangles or fingers (your choice) and make a beautiful presentation of these tasty sandwiches on our elegant tiered display stands or vintage platters. Freshly baked in house bite-size desserts are beautifully presented on our artisan cake stands and stackable displays. We fresh-brew enough piping hot tea to last all afternoon. 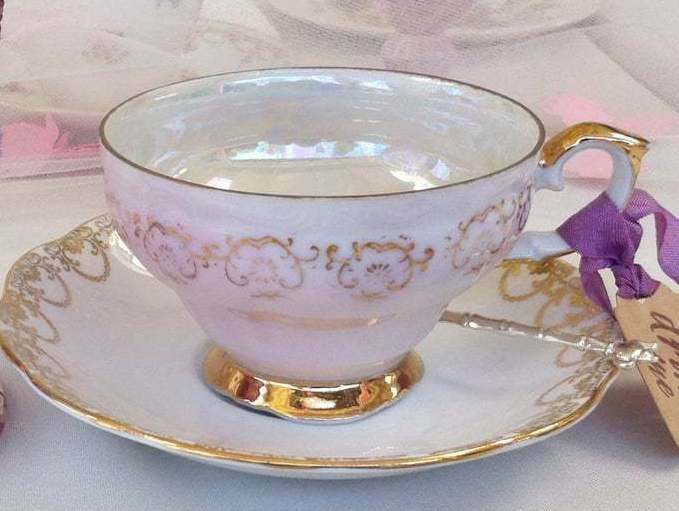 Poured from our vintage teapots and served in a dainty teacup with a saucer. Choose 2 teas from our extensive selection of black, green, white and herbal teas (see below). 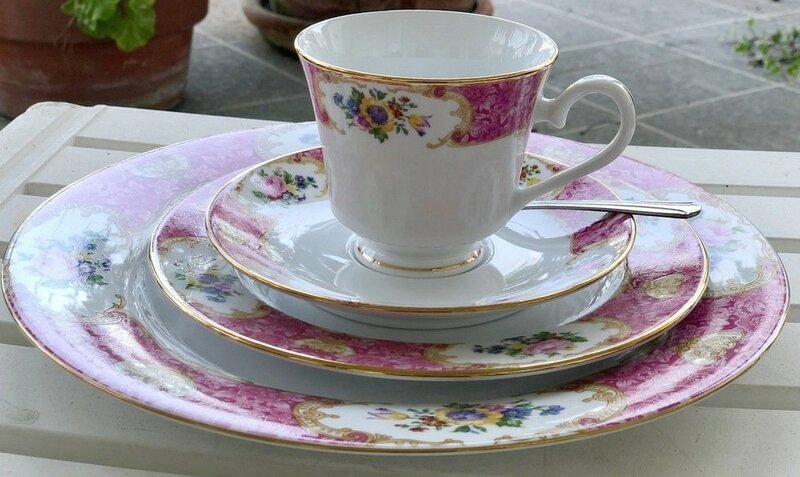 Two choices of china place settings included for each guest; Vintage mix and match or elegant matching pink “Lady Carlyle” tea sets. 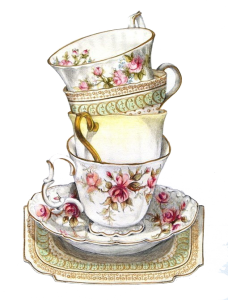 English Breakfast Tea: Full bodied, robust and rich, an extremely versatile tea. Served either black with a slice of lemon or the traditional English way with a splash of milk and perhaps a teaspoon of sugar. Decaf available. Earl Grey: A delicate tea blend with a distinctive flavor and aroma derived from the addition of oil extracted from the rind of the bergamot orange. Served either black with a slice of lemon or a splash of milk. Decaf available. Darjeeling: Considered to be the champagne of teas with its intoxicating aroma and subtle muscatel flavor. 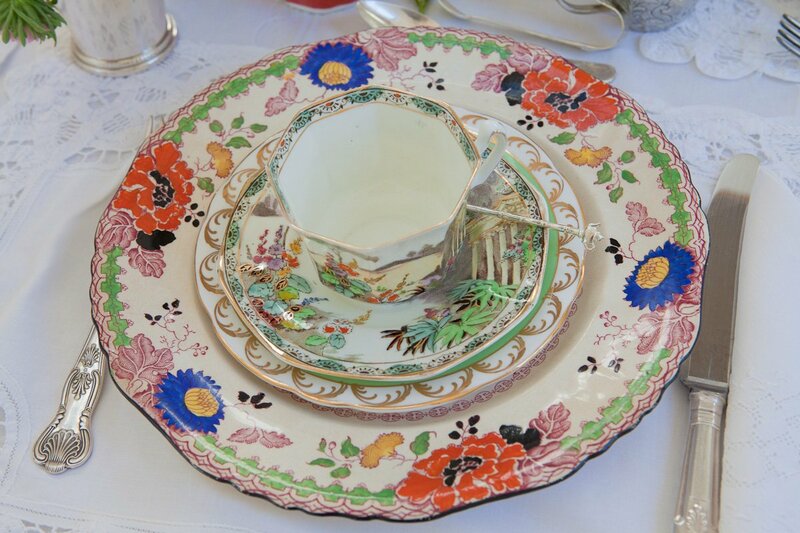 Ideal for afternoon tea. Served black. Chai: A rich, robust blend of black tea, cinnamon, cardamom, black pepper & spices. Delicious served either black or as a special treat with steamed milk and honey. Berry Blossom White: A white tea with enticing hints of blueberry and white cranberry. Hints of blueberry and crisp white cranberry. Apricot Vanilla Cream: fruity and tangy with creamy notes of rooibos. Cucumber White: A replenishing infusion of white tea. Chamomile: Made from chamomile flowers believed to have a calming and relaxing effect. Peppermint: A clean, fresh invigorating tea, good for the digestion and relaxation. Rooibos: The red bush of Africa – a tea with a pleasing sweetness and distinctive taste. Served black with a little sweetener. smooth. Served black with a touch of honey. Passion: An herbal blend of hibiscus, lemongrass, mango & passion fruit. Juicy berry, wine-like, earthy. Served black with lemon or sweetener. Sweet Cinnamon Spice: Big, flavorful tea swirling with sweet cinnamon and spicy star anise. Jasmine: A Sweet and smooth Chinese tea made from green tea leaves that are scented with Jasmine flowers. A very sophisticated tea best served without milk. China Green Tea: Fresh and lively green tea with a light and lingering flavor. Grassy, vegetative, sweet rice. Zen Green Tea: An enlightening blend of green tea with spearmint and lemony flavors. Earthy, lemony, minty, sweet. Green Ginger: A bright blend of green teas with the zing of ginger and a hint of pear. Gingery, lemon, peach, smoky earth.